Snapshots of databases are made without interrupting the server’s work (Volume Shadow Copy Service provides recoverability of backups). To restore a database, the plug-in stops the respective SQL instance, then copies the files, and then re-launches it. You can use the MSSQL plug-in to back up and restore all versions of Microsoft SQL Server 2005, 2008, 2012 and 2016. Note that for 32-bit and 64-bit versions of Windows Server, you need to use 32-bit and 64-bit version of Handy Backup, respectively. To use the MSSQL plug-in, Workstation must have enough privileges to make API calls to SQL Writer Service and Volume Shadow Copy Service. Folders correspond to SQL Servers and carry the respective names. They have no attributes. Files correspond to databases available on the selected SQL Server, and carry the respective names. They have no attributes. Since the plug-in’s files and folders have no attributes, during comparison with files that are already backed up, they will be always considered as different. This means that incremental backup (backing up of new and changed files) won’t work: for effective versioning, use differential backup. As a result of backup, you will have files that are named similarly to databases. Each file is basically a ZIP archive with all data files and transaction logs of the respective database. 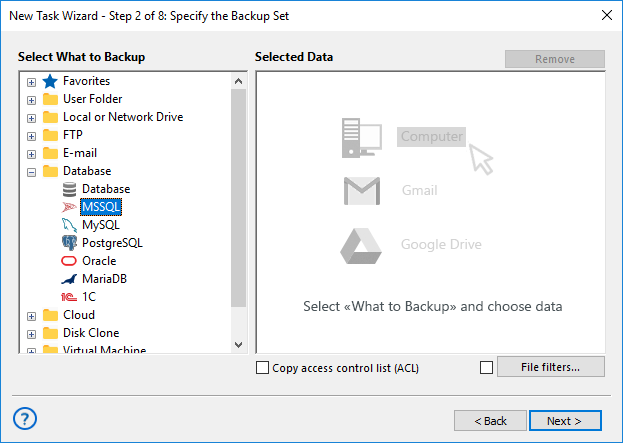 The MSSQL plug-in can only be used as a source of data for backup tasks. To learn more, please refer to Specify Backup Set. In the Data Sources pane, click on the plug-in name MSSQL. The Select data... dialog will open. 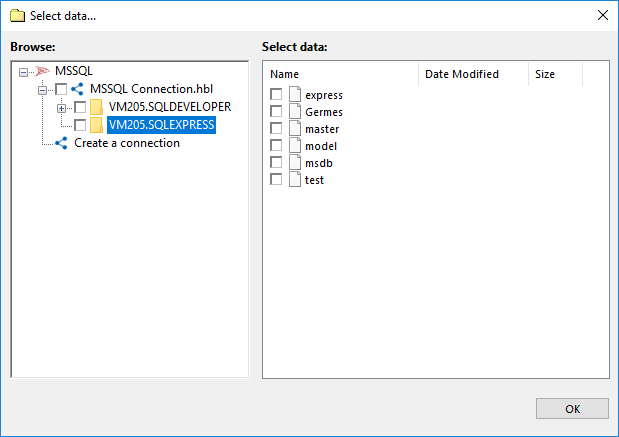 Select a connection to MSSQL Server. If you still have no one, click Create a connection…. 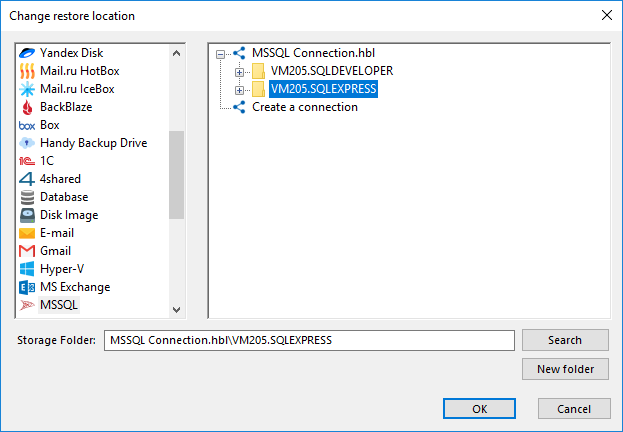 In a connection dialog, provide the parameters to connect with a MSSQL server. Give a name for your connection. Mark the checkboxes next to files (i.e. databases) that you want to back up. Whan you finish, click OK. Selected data will appear in the Backup Set pane of the New Task Wizard. When the plug-in restores databases, it queries the SQL Writer Service to identify paths of the respective files. If new paths don’t correspond to the ones in backup files, restoration will be performed to the new paths. This means that if you want, you can restore databases to a different place. Browse for the index file (backup.hbi) located in the destination folder. Select it, and then click Next. In the Select Restore Locations dialog, verify the details of restoration. 4.1. 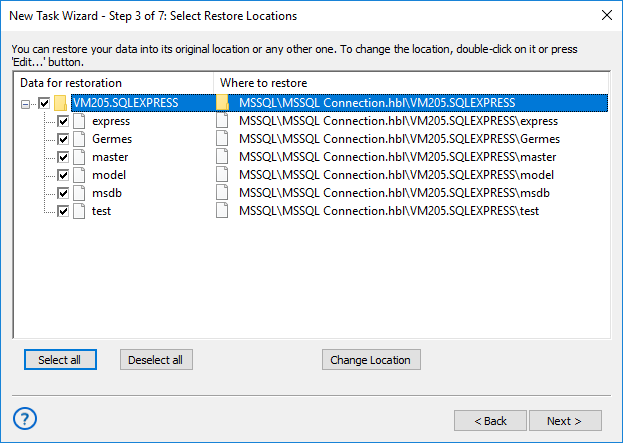 In the Select Restore Locations dialog, select a database (file of the MSSQL plug-in file system), and then click Change Location. The Change restore location dialog opens. 4.2. Select a new path for the database, and then click OK.
After verifying paths of restoration, you need to select type of restoration, enter decryption password (optional), and name the task. These steps are not specific to the MySQL plug-in. To learn more, please see Restore Task. When you run the restoration, the plug-in firstly stops the respective SQL instance and all Windows services that depend on it. Then it copies the files to their original locations, and re-launches the services.